The Tablescapes Kickstarter was successfully funded and the theme I was after unlocked quite early in the process. 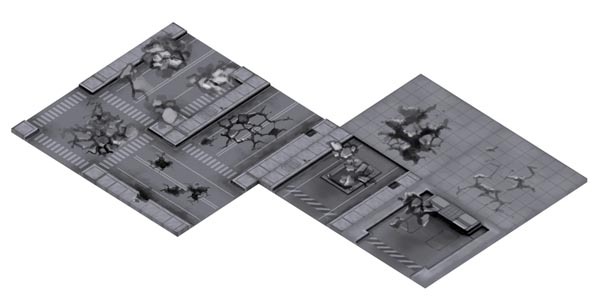 I was very keen on the Urban Streets theme as I wanted a series of tiles I can use for 30k/40k battles. Urban Streets was offered in "Clean" or "Damaged". 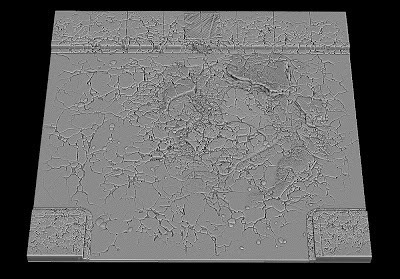 The concept art for the "Damaged" theme is shown above. In the end I have pledged (and paid) for an 8' x 4' table or 32 tiles. I intend to take 16 Damaged and 16 Clean tiles. This cost USD 225 including postage. 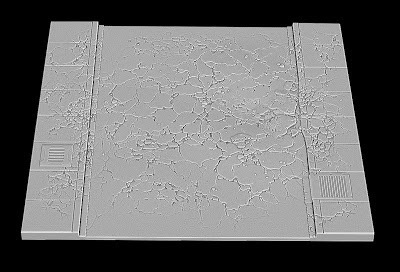 I have also bought a four tile Display Board option where I will be able to get additional Urban Street Foundation tiles. The Foundation tiles are non-street tiles - effectively plazas where you can put buildings. Some come in the main sets but the additional four unlock far more setups. So all up the Kickstarter has cost me USD$275 including shipping for a 9'x4' (or 6'x6') urban table. I'll let you all see the product upon delivery (expected before October 2013). Congrats, it was a very nice KS project. I notice recent comments have shipping for the urban streets to be December, not October, so you might not get it for xmas. Still, I will probably plump for ruined temple, so I have to wait nearly a year. Plenty of time to get some toys painted to use on the new board!